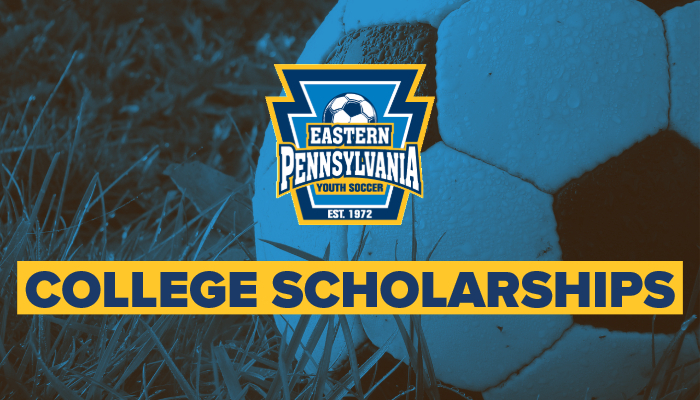 Each year Eastern Pennsylvania Youth Soccer awards four college scholarships worth $1,000 per year and renewable for up to four years to high school seniors within the state association. In order to be eligible, students must be registered players, referees, volunteer coaches, or work as TOPSoccer buddies with Eastern Pennsylvania Youth Soccer. Applicants must obtain a statement from their guidance counselor or their high school principal regarding their scholastic ability, leadership, and character, and mail it under a separate cover to the above address. Applicants may also submit a maximum of two letters from coaches, mentors or community leaders to validate qualities in leadership and character. Please include your name on all materials sent to the committee. Selection of the winners will be based on scholastic achievement, community service and leadership ability. Selection to be made by a committee that consists of people who are not relatives of any of the candidates and will also consist of people outside of Eastern Pennsylvania Youth Soccer. ____ Complete Application [PDF] and send to Eastern Pennsylvania Youth Soccer. ____ Statement from guidance counselor/principle under separate cover. ____ Additional letters from community leaders.